Aurinia Pharmaceuticals Inc. or the Company is a clinical stage biopharmaceutical company, focused on developing and commercializing therapies to treat targeted patient populations that are suffering from serious diseases with a high unmet medical need. The Company is currently developing voclosporin, an investigational drug, for the treatment of lupus nephritis (LN), focal segmental glomerulosclerosis (FSGS), and Dry Eye Syndrome (DES). Aurinia's head office is located at #1203-4464 Markham Street, Victoria, British Columbia, V8Z 7X8. The Company has its registered office located at #201, 17904-105 Avenue, Edmonton, Alberta, T5S 2H5 where the finance function is performed. Aurinia Pharmaceuticals Inc. is incorporated pursuant to the Business Corporations Act (Alberta). The Company’s common shares are currently listed and traded on the NASDAQ Global Market (NASDAQ) under the symbol AUPH and on the Toronto Stock Exchange (TSX) under the symbol AUP. 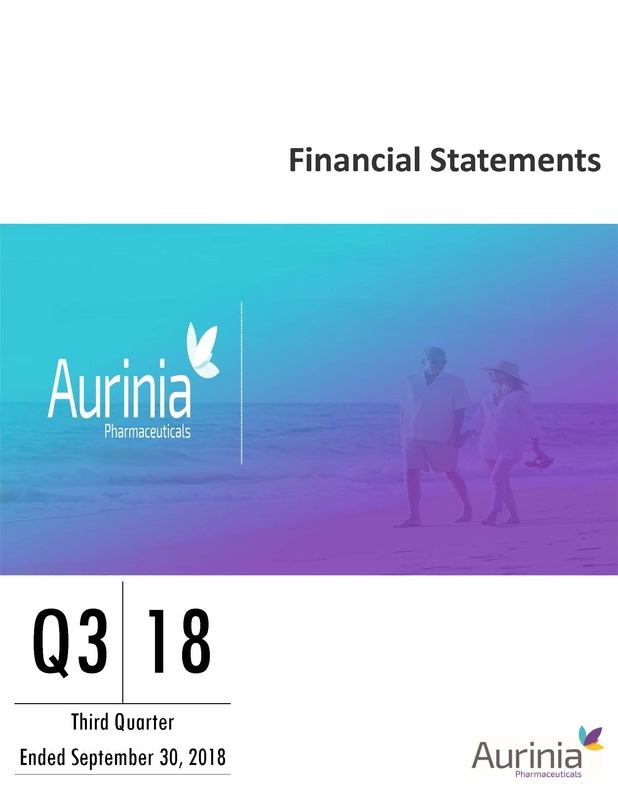 These consolidated financial statements include the accounts of the Company and its wholly owned subsidiaries, Aurinia Pharma U.S., Inc. (Delaware incorporated) and Aurinia Pharma Limited (UK incorporated). These interim condensed consolidated financial statements of the Company have been prepared in accordance with International Financial Reporting Standards (IFRS), as applicable to interim financial reports including IAS 34, Interim Financial Reporting, and should be read in conjunction with the annual financial statements of the Company for the year ended December 31, 2017 which have been prepared in accordance with IFRS, as issued by International Accounting Standards Board (IASB). These interim condensed consolidated financial statements were authorized for issue by the audit committee of the Board of Directors on November 6, 2018. The interim condensed consolidated financial statements have been prepared on a going concern and historical cost basis, other than certain financial instruments recognized at fair value. These interim condensed consolidated financial statements are presented in United States (US) dollars, which is the Company’s functional currency. The Company has adopted the accounting standards as described in Note 12 - Changes in accounting policies. The Company has not yet adopted the following new and revised standard. In January, 2016, the IASB issued IFRS 16 Leases, which will replace IAS 17 Leases. Under IFRS 16, a contract is, or contains, a lease if the contract conveys the right to control the use of an identified asset for a period of time in exchange for consideration. Under IAS 17, lessees were required to make a distinction between a finance lease and an operating lease. IFRS 16 now requires lessees to recognise a lease liability reflecting future lease payments and a right-of-use asset for virtually all lease contracts. There is an optional exemption for certain short-term leases and leases of low-value assets; however, this exemption can only be applied by lessees. The standard is effective for annual periods beginning on or after January 1, 2019, with earlier adoption if IFRS 15 is also applied. Aurinia has elected to adopt IFRS 16 effective January 1, 2019. To date, management has identified two facility leases that will be impacted by the new standard and are assessing the potential financial impact that the adoption of IFRS 16 will have on the Company's consolidated financial statements with regards to these facility leases. Management is also currently reviewing Aurinia's non-facility related contracts and agreements to determine whether any of the agreements will be impacted by IFRS 16. Upon adoption of IFRS 9, the Company determined that its business model for managing short term investments is to hold the investments for cash flow collection and this is congruent with the classification of financial assets held at amortized cost outlined in IFRS 9. As a result, on January 1, 2018, the Company has reclassified short term investments originally held as available for sale at December 31, 2017 to short term investments held at amortized cost without restating comparative information. For further information regarding the adoption of IFRS 9 see note 12. The average duration of the interest-bearing securities is 1.05 years and the average yield to maturity is 1.66%. For the year ended December 31, 2017 short term investments held at fair value were classified as Level 2 in the fair value hierarchy and the fair value was determined by using quoted market prices. The outstanding fair value of contingent consideration payable to ILJIN SNT Co., Ltd. (ILJIN) an affiliated shareholder and related party, is the result of an Arrangement Agreement (the Agreement) completed on September 20, 2013 between the Company, Aurinia Pharma Corp. and ILJIN. Pursuant to the Agreement, remaining payments of up to $7,850,000 may be paid dependent on the achievement of pre-defined clinical and marketing milestones. In the second quarter ended June 30, 2017 the Company paid ILJIN $2,150,000 upon the achievement of two specific milestones reducing the original $10,000,000 contingent consideration to $7,850,000. The fair value estimates at September 30, 2018 were based on a discount rate of 10% (December 31, 2017 - 10%) and a presumed payment range between 50% and 74% (December 31, 2017 - 50% and 75%). The fair value of this contingent consideration as at September 30, 2018 was estimated to be $4,034,000 (December 31, 2017 - $3,792,000) and was determined by estimating the probability and timing of achieving the milestones and applying the income approach. The passage of time resulted in a revaluation of contingent consideration expense of $93,000 and $242,000 respectively for the three and nine month periods ended September 30, 2018 compared to $88,000 and $436,000 respectively for the same periods in 2017.
approximately $172,000. If the discount rate were to decrease to 8%, this would increase the NPV of the obligation by approximately $183,000. In accordance with IFRS, a contract to issue a variable number of shares fails to meet the definition of equity and must instead be classified as a derivative liability and measured at fair value with changes in fair value recognized in the consolidated statements of operations and comprehensive loss at each period-end. The derivative liabilities will ultimately be converted into the Company’s equity (common shares) when the warrants are exercised, or will be extinguished on the expiry of the outstanding warrants, and will not result in the outlay of any cash by the Company. Immediately prior to exercise, the warrants are remeasured at their estimated fair value. Upon exercise, the intrinsic value is transferred to share capital (the intrinsic value is the share price at the date the warrant is exercised less the exercise price of the warrant) . Any remaining fair value is recorded through the statement of operations and comprehensive loss as part of the change in estimated fair value of derivative warrant liabilities. On December 28, 2016, the Company completed a $28,750,000 Bought Deal public offering (the Offering). Under the terms of the Offering, the Company issued 12,778,000 units at a subscription price per Unit of $2.25, each Unit consisting of one common share and one-half (0.50) of a common share purchase warrant (a Warrant), exercisable for a period of five years from the date of issuance at an exercise price of $3.00. The holders of the Warrants issued pursuant to this offering may elect, if the Company does not have an effective registration statement registering or the prospectus contained therein is not available for the issuance of the Warrant Shares to the holder, in lieu of exercising the Warrants for cash, a cashless exercise option to receive common shares equal to the fair value of the Warrants. The fair value is determined by multiplying the number of Warrants to be exercised by the weighted average market price less the exercise price with the difference divided by the weighted average market price. If a Warrant holder exercises this option, there will be variability in the number of shares issued per Warrant. At initial recognition on December 28, 2016, the Company recorded a derivative warrant liability of $7,223,000 based on the estimated fair value of the Warrants. There have been no derivative warrant exercises in 2018. There were no derivative warrant exercises for the three month period ended September 30, 2017. In the three month period ended June 30, 2017, 6,000 warrants were exercised at $3.00 per share for gross proceeds of $19,000. As the Company had an effective registration statement during this period these warrants could only be exercised for cash. These Warrants had an estimated fair value of $31,000 on the dates of exercise, determined using the Black-Scholes warrant pricing model. Of this amount, $23,000 was transferred from the derivative warrant liabilities to equity (common shares) and $8,000 was recorded through the statement of operations and comprehensive loss as part of the change in estimated fair value of derivative warrant liabilities. In the three month period ended March 31, 2017, 2,859,000 warrants were exercised at $3.00 per share for gross proceeds of $8,577,000. As the Company had an effective registration statement during this period these warrants could only be exercised for cash. These Warrants had an estimated fair value of $16,235,000 on the dates of exercise, determined using the Black-Scholes warrant pricing model. Of this amount, $12,399,000 was transferred from derivative warrant liabilities to equity (common shares) and $3,836,000 was recorded through the statement of operations and comprehensive loss as part of the change in estimated fair value of derivative warrant liabilities. The Company uses the Black-Scholes pricing model to estimate fair value. The Company considers expected volatility of its common shares in estimating its future stock price volatility. The risk-free interest rate for the life of the Warrants was based on the yield available on government benchmark bonds with an approximate equivalent remaining term at the time of issue. The life of the warrants is based on the contractual term. As at September 30, 2018, the Company revalued the remaining derivative warrants at an estimated fair value of $15,158,000 (December 31, 2017 – $8,948,000). The Company recorded an increase in the estimated fair value of the derivative warrant liability of $3,076,000 for the three months ended September 30, 2018 (September 30, 2017 - $382,000 - decrease in estimated fair value of the derivative warrant liability). The following assumptions were used to estimate the fair value of the derivative warrant liability on September 30, 2018 and December 31, 2017. On February 14, 2014, the Company completed a $52,000,000 private placement. Under the terms of the Offering, the Company issued 18,919,404 units at a subscription price per Unit of $2.7485, each Unit consisting of one common share and one-quarter (0.25) of a common share purchase warrant (a Warrant), exercisable for a period of five years from the date of issuance at an exercise price of $3.2204. The holders of the Warrants issued pursuant to the February 14, 2014 private placement may elect, in lieu of exercising the Warrants for cash, a cashless exercise option to receive common shares equal to the fair value of the Warrants based on the number of Warrants to be exercised multiplied by a five-day weighted average market price less the exercise price with the difference divided by the weighted average market price. If a Warrant holder exercises this option, there will be variability in the number of shares issued per Warrant. In the three month period ended September 30, 2017, a holder of 20,000 Warrants elected this option and the Company issued 11,000 common shares upon the cashless exercise of these Warrants. These Warrants had an estimated fair value of $85,000 on the date of exercise, determined using the Black-Scholes warrant pricing model. In the three month period ended June 30, 2017, a holder of 1,364,000 Warrants elected this option and the Company issued 749,000 common shares upon the cashless exercise of these Warrants. These Warrants had an estimated fair value of $6,299,000 on the date of exercise, determined using the Black-Scholes warrant pricing model. Of this amount, $5,526,000 was transfered from derivative warrant liabilities to equity (common shares) and $773,000 was recorded through the statement of operations and comprehensive loss as part of the change in estimated fair value of derivative warrant liabilities. In the three month period ended March 31, 2017, a holder of 489,000 Warrants elected this option and the Company issued 308,000 common shares upon the cashless exercise of these Warrants. These Warrants had an estimated fair value of $2,870,000 on the date of exercise, determined using the Black-Scholes warrant pricing model. In addition, another holder of 27,000 warrants exercised these warrants for cash and received 27,000 common shares. The Company received cash proceeds of $88,000. The exercised warrants had an estimated fair value of $3,029,000 on the date of exercise determined using the Black-Scholes warrant pricing model. Of this amount, $2,834,000 was transferred from derivative warrant liabilities to equity (common shares) and $195,000 was recorded through the statement of operations and comprehensive loss as part of the change in estimated fair value of derivative warrant liabilities. As at September 30, 2018, the Company revalued the remaining derivative warrant liability at an estimated fair value of $5,996,000 (December 31, 2017 – $2,845,000). The Company recorded an increase in the estimated fair value of the derivative warrant liability of $1,721,000 for the three months ended September 30, 2018 (September 30, 2017 – $27,000 - increase in the estimated fair value of derivative warrant liabilities). The Company considers expected volatility of its common shares in estimating its future stock price volatility. The risk-free interest rate for the expected life of the Warrants was based on the yield available on government benchmark bonds with an approximate equivalent remaining term at the time of the grant. The expected life is based on the contractual term. The Company uses the Black-Scholes pricing model to estimate fair value. The following assumptions were used to estimate the fair value of the derivative warrant liability on September 30, 2018 and December 31, 2017. These derivative warrant liabilities are Level 3 recurring fair value measurements. The key Level 3 inputs used by management to estimate the fair value are the market price and the expected volatility. If the market price were to increase by a factor of 10%, this would increase the estimated fair value of the obligation by approximately $3,298,000 as at September 30, 2018. If the market price were to decrease by a factor of 10%, this would decrease the estimated fair value of the obligation by approximately $3,262,000. If the volatility were to increase by 10%, this would increase the estimated fair value of the obligation by approximately $360,000. If the volatility were to decrease by 10%, this would decrease estimated fair value of the obligation by approximately $340,000 as at September 30, 2018. On March 20, 2017 the Company completed a public offering of 25,645,000 common shares at a price of $6.75 per share. Gross proceeds from this Offering were $173,104,000 and share issue costs totaled $10,780,000 which included a 6% underwriting commission of $10,386,000 and other offering expenses. The maximum number of Common Shares issuable under the Stock Option Plan is equal to 12.5% of the issued and outstanding Common Shares at the time the Common Shares are reserved for issuance. As at September 30, 2018 there were 85,323,000 Common Shares of the Company issued and outstanding, resulting in a maximum of 10,665,000 options available for issuance under the Stock Option Plan. An aggregate total of 7,545,000 options are presently outstanding in the Stock Option Plan, representing 8.8% of the issued and outstanding Common Shares of the Company. On May 2, 2016, the Company granted 200,000 inducement stock options to a new employee pursuant to Section 613(c) of the TSX Company Manual at a price of $2.92 (CA$3.66). These options vest in equal amounts over 36 months and are exercisable for a term of five years. In 2017, this employee exercised 16,000 of these options to hold 184,000. These options are recorded outside of the Company’s stock option plan. The Stock Option Plan requires the exercise price of each option to be determined by the Board of Directors and not to be less than the closing market price of the Company’s stock on the day immediately prior to the date of grant. Any options which expire may be re-granted. The Board of Directors approves the vesting criteria and periods at its discretion. The options issued under the plan are accounted for as equity-settled share-based payments. These options vest in equal amounts over 12 months and are exercisable for a term of ten years. These options vest in equal amounts over 36 months and are exercisable for a term of ten years. These options vest 12/36 on the 12-month anniversary date and thereafter 1/36 per month over the next 24 months and are exercisable for a term of ten years. One quarter of the options vested immediately, with the remainder of the options vesting each month in equal amounts over a period of 36 months and are exercisable for a term of ten years. Stock options are granted at a Canadian Dollar (CA$) exercise price, and converted to US Dollars (US$) based on the exchange rate when these stock options are granted. Application of the fair value method resulted in charges to stock-based compensation expense of $1,506,000 and $5,646,000 for the three and nine month periods ended September 30, 2018 respectively (2017 – $1,068,000 and $3,287,000) with corresponding credits to contributed surplus. For the three and nine months ended September 30, 2018, stock compensation expense has been allocated to research and development expense in the amount of $619,000 and $2,173,000 respectively (2017 –$273,000 and $692,000) and corporate, administration and business development expense in the amount of $887,000 and $3,473,000 respectively (2017 – $795,000 and $2,595,000). If the stock price volatility was higher by a factor of 10% on the option grant dates in 2018, this would have increased annual stock compensation expense by approximately $308,000. If the stock price volatility was lower by a factor of 10% on the grant date, this would have decreased annual stock compensation expense by approximately $264,000. The Company used the Black-Scholes option pricing model to estimate the fair value of the options granted in 2018 and 2017. The Company considers historical volatility of its common shares in estimating its future stock price volatility. The risk-free interest rate for the expected life of the options was based on the yield available on government benchmark bonds with an approximate equivalent remaining term at the time of the grant. The expected life is based upon the contractual term, taking into account expected employee exercise and expected post-vesting employment termination behavior. Basic and diluted net loss per common share is computed by dividing net loss by the weighted average number of common shares outstanding for the period. In determining diluted net loss per common share, the weighted average number of common shares outstanding is adjusted for stock options and warrants eligible for exercise where the average market price of common shares for the three and nine months ended September 30, 2018 exceeds the exercise price. Common shares that could potentially dilute basic net loss per common share in the future that could be issued from the exercise of stock options and warrants were not included in the computation of the diluted loss per common share for the three and nine months ended September 30, 2018 and September 30, 2017 because to do so would be anti-dilutive. The Company’s operations comprise a single reporting segment engaged in the research, development and commercialization of therapeutic drugs. As the operations comprise a single reporting segment, amounts disclosed in the consolidated financial statements represent those of the single reporting unit. In addition, all of the Company’s long-lived assets are located in Canada. The following geographic information reflects revenue based on customer location. The Company has entered into contractual obligations for services and materials required for its clinical trial program, drug manufacturing and other operational activities. This note explains the impact of the adoption of IFRS 9 Financial Instruments, IFRS 15 Revenue from Contracts with Customers and IFRS 2 Share based payment on the Company’s financial statements and discloses the new accounting policies that have been applied from January 1, 2018, where they are different to those applied in prior periods. The adoption of IFRS 9 Financial Instruments using the modified retrospective approach on January 1, 2018 (the date of initial application of IFRS 9) results in a change in accounting policy. In accordance with the transitional provisions in IFRS 9, comparative figures have not been restated. The reclassification of financial assets have therefore been recognized in the opening balance sheet on January 1, 2018. The new standard introduces expanded disclosure requirements and changes in presentation, these have minimally impacted the nature and extent of our disclosures. IFRS 9 is a three-part standard to replace IAS 39 Financial Instruments: Recognition and Measurement, addressing new requirements for (i) classification and measurement, (ii) impairment, and (iii) hedge accounting. On January 1, 2018 the Company has assessed which business models apply to the financial assets held by the Company and has classified its financial instruments into the appropriate IFRS 9 categories. There was no impact to the financial liabilities held by the Company. Cash and cash equivalents, short term investments and accounts receivable are recorded initially at fair value and subsequently at amortized cost using the effective interest method less any provisions for impairment. The investments held at December 31, 2017 were reclassified from available for sale to amortized cost. At January 1, 2018, the date of initial application, the Company's business model is to hold investments for collection of contractual cash flows, and the cash flows represent solely payments of principal and interest on the principal amount. The fair value loss of $78,000 would have otherwise been recognized in other comprehensive income (OCI) had the short term investments not been reclassified to amortized cost. There was no impact to cash and cash equivalents and accounts receivable resulting from the adoption of IFRS 9. The new impairment model requires the recognition of impairment provisions based on expected credit losses rather than only incurred credit losses as is the case under IAS 39. The Company has a nominal amount of accounts receivable, therefore, the change in impairment methodology due to the new standard does not have a significant impact on the financial statements. The Company's cash and cash equivalents and short term investments are also subject to the impairment requirements of IFRS 9, the identified impairment loss is not material. The Company had not entered into any hedges as at December 31, 2017 and has not undertaken hedging activities in the period ended September 30, 2018 therefore the hedge accounting section standard is not applicable to the Company at this time and does not have an impact on the financial statements. From January 1, 2018 the Company classifies its financial assets as to be measured at amortized cost. The classification depends on the Company’s business model for managing the financial assets and the contractual terms of the cash flows. The Company will reclassify the investments when and only when its business model for managing those assets changes. At initial recognition, the Company measures a financial asset at its fair value plus, in the case of a financial asset not at fair value through profit or loss (FVPL), transaction costs that are directly attributable to the acquisition of the financial asset. Transaction costs of financial assets carried at FVPL are expensed in profit or loss. Subsequent measurement of debt instruments depends on the business model for managing the asset and the cash flow characteristics of the asset. Assets that are held for collection of contractual cash flows where those cash flows represent solely payment of principal and interest are measured at amortized cost. Interest income from these financial assets is included in financing income using the effective interest rate method. Any gain or loss arising on derecognition is recognized directly in profit or loss and presented in other income (expense), together with foreign exchange gains and losses. From January 1, 2018, the Company assesses on a forward-looking basis the expected credit losses associated with its debt instruments carried at amortized cost and fair value through other comprehensive income (FVOCI). The impairment methodology applied depends on whether there has been a significant increase in credit risk. For receivables, the Company applied the simplified approach permitted by IFRS 9 which requires expected lifetimes losses to be recognized from initial recognition of the receivables. The adoption of IFRS 15 Revenue from Contracts with customers using the modified retrospective and the completed contract practical expedient approaches on January 1, 2018 (the date of initial application of IFRS 15) does result in a change in accounting policy. However, the adoption did not have a material impact on the financial statements, and as a result the 2017 comparatives are not required to be restated. The new standard replaces IAS 18, Revenue, IAS 11 Construction Contracts, and other interpretive guidance associated with revenue recognition. IFRS 15 provides a single model to determine how and when an entity should recognize revenue, as well as requiring entities to provide more informative, relevant disclosures in respect of its revenue recognition criteria. The modified retrospective approach results in the cumulative effect, if any, of adoption being recognized at the date of initial application. The Company currently has no product sales or significant sources of revenue, therefore there is no effect upon initial application. The Company has agreements in specific regions with strategic partners. These agreements usually include one-time payments (upfront payments), payments for research and development services in the form of cost reimbursements, milestone payments and royalty receipts. Once the Company determines that a contract exists and the contract is with a customer, it identifies the performance obligations within the contract. A performance obligation is a promise to provide a distinct good or service or a series of distinct goods or services and is the unit of account for recognizing revenue. Next the Company determines the transaction price. The transaction price reflects the amount of consideration to which the Company expects to be entitled in exchange for the goods or services transferred. Management takes into account consideration that is variable and only includes variable consideration to the extent that it is highly probable that a significant reversal in the amount of cumulative revenue recognized will not occur when the uncertainty associated with the variable consideration is subsequently resolved. The transaction price is then allocated to the various performance obligations based on the relative standalone selling prices of the goods or services being provided. Revenue is recognized when or as performance obligations are satisfied by transferring control of a promised good or service to a partner at a point in time or over time. License fees representing non-refundable payments received at the time of signature of license agreements are recognized as revenue upon signature of the license agreements when the Company has no significant future performance obligations and collectability of the fees is reasonably assured. These licenses provide a right to use the Company’s intellectual property. Upfront payments received at the beginning of licensing agreements when the Company has significant future performance obligations are deferred and recognized as revenue on a systematic basis over the period during which the related services are rendered and all obligations are performed. These licenses provide a right to access the Company’s intellectual property. The Company recorded licensing revenue of $30,000 and $89,000 for the three and nine month periods ended September 30, 2018 ($29,000 and $88,000 - for the three and nine month periods ended September 30, 2017) related to the upfront license payment of $1,500,000 received in 2010 pursuant to the 3SBio Inc. license agreement. Under the agreement, the primary substantive obligations of the Company are to grant the license and transfer intellectual knowledge to 3SBio. Under the agreement, the Company is also required to maintain the patent portfolio in China, Taiwan and Hong Kong, and to provide further support and cooperation to 3SBio over the life of the agreement, which coincides with the life of the patents. Any additional assistance which may be provided to 3SBio will be performed on a full cost recovery basis. The deferred licensing fee revenue is recognized on a straight-line basis as the Company satisfies the performance obligations over the life of the patents and the benefit to the customer transfers ratably throughout the patent life, which expires in 2022. As at September 30, 2018 $471,000 (December 31, 2017 - $560,000) of deferred revenue remains relating to this payment. The Company will provide commercial supply to 3SBio on a cost-plus basis and will receive ongoing royalties based on sales of voclosporin by 3SBio. On April 17, 2017 the Company entered into an agreement with Merck Animal Health (MAH) whereby the Company granted them worldwide rights to develop and commercialize its patented nanomicellar voclosporin ophthalmic solution (“VOS”) for the treatment of Dry Eye Syndrome in dogs. Under the terms of the agreement, the Company received a Technology Access fee of $300,000. This agreement provided MAH with a right to use intellectual property. MAH was able to direct the use of and obtain substantially all of the benefits from the license at the time that control of the rights were transferred and therefore, the $300,000 Technology Access fee was recognized as revenue in fiscal 2017. The Company is eligible to receive further payments based on certain development and sales milestones and to receive royalties based on global product sales. The Company earned a contract milestone of $345,000 (CA$450,000) pursuant to a purchase and sale agreement dated February 14, 2014 between Ciclofilin Pharmaceuticals Corp. (now Contravir Pharmaceuticals, Inc.) and Aurinia Pharmaceuticals Inc. under which the Company sold the Non-Immunosuppressive Cyclosporine Analogue Molecules (NICAMs) early stage research and development asset to Ciclofilin. The Company recorded contract revenue and accounts receivable of $345,000 for the three months ended September 30, 2018 based on the milestone being achieved during the period. The receivable was collected in full in October of 2018. The Company is eligible to receive further payments based on certain development and sales milestones and to receive royalties based on global product sales. The Company has no obligations under this agreement. Milestone payments, which are generally based on developmental or regulatory events, are forms of variable consideration and are only included in the transaction price when it is highly probable that a significant reversal will not occur when the uncertainty associated with the milestone is subsequently resolved. Therefore, milestone payments that do not meet the highly probable criteria are recognized as revenue when the milestones are achieved, collectability is assured, and when the Company has no significant future performance obligations in connection with the milestones. Royalty income is recognized on the accrual basis as they are earned and when collection is reasonably assured in accordance with the substance of the relevant agreement. In June, 2016, the IASB issued final amendments to IFRS 2, clarifying how to account for certain types of share based payment transactions. These amendments, which were developed through the IFRS Interpretations Committee, provide requirements on the accounting for: (i) the effect of vesting and non-vesting conditions on the measurement of cash-settled share based payments; (ii) share-based payment transactions with a net settlement feature for withholding tax obligations; and (iii) a modification to the terms and conditions of a share-based payment that changes the classifications of the transaction from cash-settled to equity-settled. The Company has evaluated the impact of these amendments and as a result have determined that there is no required change to the Company's accounting policy related to Share based payments, and therefore no changes to the consolidated financial statements are required. Subsequent to September 30, 2018 the Company issued 20,000 common shares upon the exercise of 20,000 stock options for proceeds of $53,000. The company also issued 25,000 stock options to three new employees for an exercise price of $5.93(CA$7.70).